I’m not a huge fan of kickstarter. There, I said it. I know that makes me unpopular. I’m not a fan for a number of reasons, but ultimately, if people are happy to fund games that way, then good luck to them. And of course, anything that serves as a kick in the vulnerables to big evil publishers will always get my vote. There are lots of reasons to like kickstarter, but those are commonly discussed. So let me lay out briefly, my reservations, and then expand on one I find never mentioned. 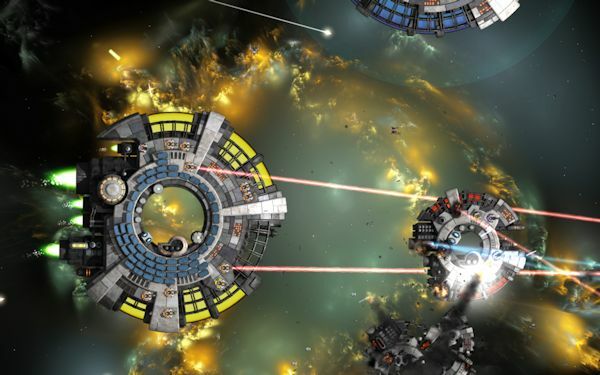 Do you want to play Gratuitous Space Battles 2.0? It will be awesome. the ships will have AI the same level of intelligence as humans, and will have forty trillion polys each. They will be in 3D this time, and physics will model every atom in the universe. There will be 500 races, 10,000 ships and a trillion different modules, all of which will be balanced perfectly. it will run on a ZX81 at 60 FPS. Yeah, I doubt that’s possible either, but when you are typing up your dreams at the start of a project, it’s very easy to get carried away. Selling dreams is a very different skill to actually building a final product. We should be rewarding people who can deliver, not who can dream. We can all name developers who can dream but not deliver. We are cynical when politicians do this, why not game developers? I sketched out a great game idea on my chalkboard recently, I got very excited about it, started doing a proper design doc, and half way through the design, I realized it had some fundamental flaws that meant although it *sounded good*, it wasn’t going to work as a game. I had to abandon the idea. I COULD abandon the idea, as I owed nobody anything. Nobody even knew I’d considered it as a game idea. When people fund a game, they fund a game, and although a lot of gamers will be understanding if you explain major changes, some will not. Some gamers get VERY VERY angry. This is a no-win situation, either backers get angry, or the developer sticks with what turns out to be a flawed idea. No game I’ve ever made bares any relationship to my original design for it. As a developer, paying me in advance could make me lazy. a lot of developers will get an extra hours sleep every morning knowing they’ve already been paid for the next years work. When I worked for a certain game designer, I found him to be a single-minded megalomaniacal obsessive dictator who knew he was right. Then I ended up as sole-owner and game designer and programmer and discovered I am exactly the same, which was an interesting lesson :D I truly believe that in many cases good game design does come from single-minded, frankly arrogant people who are obsessed with their ‘vision’ and who think they are right. We’ve all seen Hollywood movie cash-ins designed by a team of scriptwriters. I am wary of the fact that with kickstarter you are basically inviting thousands of gamers to feel like they should have a seat at design meetings. They shouldn’t feel that way, but a percentage of them will. That is not good. 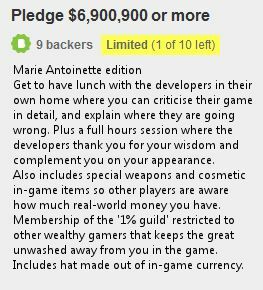 Kickstarter is the absolute poster-child for inequality amongst gamers, based on income. Now I am definitely not a raging socialist, but I know a lot of gamers are, and I find it a bit weird that it doesn’t bug them that when these kickstarter games ship, not only will gamers with more money that them be swanning around with better outfits and weapons, (This already happens in F2P games), but some of the NPC’s will have the names of the ‘wealthy’ backers. Some will even have their digitized faces in the game. Elite is actually naming PLANETS after people who back the game with a lot of money. Gamers say they hate in-game product placement and advertising. It compromises the game design for the sake of money. I agree. So why are we deciding that the best way to name our planets or design the appearance of our NPC’s is to put that part of game design up for auction? Why should gamers who are wealthy get more influence over a game that those who flip burgers for a living? The cold hard economic reality of the real world is bad enough without shoehorning it into games too. Now you might say that we have always had this, recently in F2P games, but also with ‘collectors editions’ and DLC. I sell DLC myself. But I argue there is a VAST difference. To buy ALL the DLC for GSB at full price, with no bundle or discount or anything, is still easily affordable for almost any PC gamer, if you really like the game. Not so with all the top tiers of kickstarter projects. Some of them are asking for THOUSANDS of dollars. Who do you know who has a spare thousand of five thousand dollars to spend backing a game? Years ago, it was common for bands to have ‘fan clubs’ where you could enter competitions to ‘meet the band’. Now bands sell ‘premium passes’ to wealthier fans to meet their idols backstage and have their photo taken. Anyone can get will shatner’s autograph, you just need to hand over hard cash for the ‘honor’. I don’t like this. I can imagine wanting to meet with, and shake hands with, maybe even (eek) have a beer with the people who are the biggest fans of your work. But kickstarter doesn’t do that. It hands those ‘lunch with the devs’ opportunities not to the most enthusiastic fans, but to the wealthiest. Are you sure you agree with that? Don’t flame me, I’m just asking the question :D If you still want to support kickstarter, I suggest backing ‘sir you are being hunted’, which looks awesome. Just a quick post showing a screenshot of the new ‘palladium’ class cruiser of the ‘outcasts’ race for Gratuitous Space Battles, plus some frigates alongside. The idea is to have missiles that go slowly at first, then suddenly boost towards their target. They deliberately start off at a slight angle too. 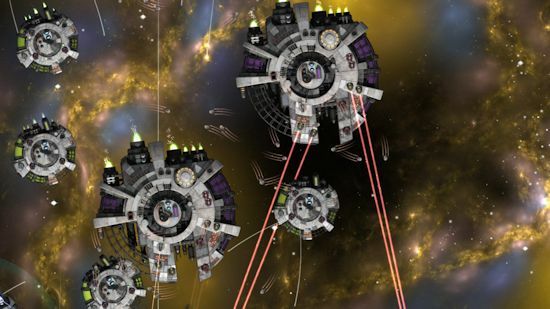 The benefit is that enemy last-minute defense don’t have much time to shoot them down, but if you have a defensive screen of point-defense frigates, then can pick them off before they start their boost stage. The plan is to have this as a frigate-only outcasts-only weapon for the next expansion. Let me know what you think. Cliffski’s 2012 guide to advertising your indie PC game online. Have you got a game that is priced at a level that will give you a decent return-on-investment for a site visitor? If your game is <$10 in price, and you do not have multiple titles to cross-promote to a visitor, then stop right now, because you are probably wasting your money. Have you got a game that people cannot buy right now? Are you hoping they will remember and come back later? If you don’t have some way of capturing them with an email signup or alpha-funding etc, then also probably stop right now. You will do much better if you can get your site visitor to click a few buttons and hand you some money right now. Are you sure your website runs fairly solidly and fast? Have you used online tools to measure load speeds, and possibly used a CDN to host demos or large screenshot images? Make sure your site is worth visiting before you pay for people to visit it. Open an account with google adwords, or your other ad service of choice. google’s is the biggest, and the most complex. Setting up an account and putting ads together will take a while, so don’t wait until release day for your game. Have everything in place at least a week in advance. Google sometimes take a while to approve ads. 90% of the effort is telling google NOT to advertise to people. Here are some tips. If you know where your sales come from, through sales reports, pick the top 10 countries, and geographically limit your adwords campaign to those. I limit mine to less than 10. for example Australia, Canada, Germany, Ireland, New Zealand, UK, USA. If your game is PC only I strongly recommend limiting ‘devices’ for the campaign to desktop and laptop computers. Not mobile phones and tablets. Also limit your language to English, unless you really are getting a lot of non-english sales. I recommend focusing on clicks, with manual CPC (cost-per-click) bidding. Not impressions. I set an impression cap per user per day to 8. Letting it be higher reduces your click-through-rate and thus your ads ranking. Add a bunch of different ads. You might want to try text ads, but I recommend banners too. And different sizes and shapes, to get as much coverage as you can. Some games look better in skyscraper ads, some as rectangles or banners. I never bother with animation (my tests show no effect), but do add lots of variety. Google will auto-sort the best performing ad for you. It costs nothing to have a dozen ads. You need to set a budget that actually has some impact. This isn’t a plan for people with $50 to spend. Spending less than $500 will probably not give enough data to properly analyze, although you might want to trickle that in over a few weeks. My yearly adwords bill was about $16,000, but it’s been higher than that before. Don’t just hit ‘go’ and then forget about it. You will want to check your campaign daily. You can analyze what is going on in the adwords interface, especially the display network tab. Sort by clicks so you can see where all those clicks are coming from. If you set up sales-page ‘conversions’ you might want to look at the cost-per-conversions column, and pause (or even exclude) any domain where the conversion cost is getting much too high. If you are letting google manage your placements on it’s own check they aren’t all taking place on some awful inappropriate site you don’t want to support, or suspect will give poor traffic. 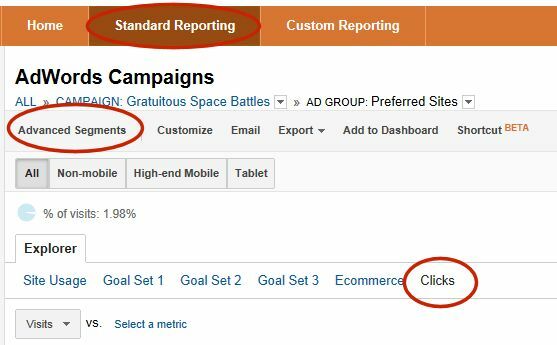 If your analytics is set up right, and linked to google adwords you will have a button on the left of the ‘standard reporting’ GUI for analytics that says advertising. You want the adwords, then placements sub menu to list where your ads are showing. This will show up a few howlers immediately, where site ‘A’ will give you ten times the average visit duration than site B. You might want to compare bounce rates too. When you do all this, make sure your landing page has some darned content! If it’s just a logo saying ‘click to enter site!! !’ then these stats are meaningless and your site needs changing. You can manually go through all the ad placements here and note the ones with decent traffic, and then go back to adwords and pause/exclude the poor performing ones, which will hone your campaign to be more effective. If you do this, you might be able to afford to raise your CPC, knowing it’s only going to traffic that is actually seriously interested. Over time, your CPC bids should rise, and your targeted audience should narrow more and more. One tip I employ to make things easier, and less cluttered is to set up an ‘advanced segment’. You will find the button just above the chart at the left. Click it, and follow the instructions to build up a segment called ‘likely buyers’. I use the fairly crude metric of ‘visit duration > 60 seconds’, but you can build up complex filters and exclusions here if you like, and know your audience well. Once set up, click that segment so that it filters the traffic for you. You will then be able to look at the lists of placements purely filtered through that segment. Remember it’s all about narrowing where you show your ads so it works FOR YOU. Every game sells differently. You MUST get your own data. Say you want to get people to download your demo / sign up your newsletter or signup for an account…whatever, and track that rather than sales. This can be done too. You probably want to set those events up as ‘conversions’ in analytics and assign them a value. That will then get tracked just like sales and those charts will show you your ROI etc. Remember… it’s very hard to be 100% sure you know if your ads are really working. You *do* need a bit of faith. If in doubt, ask yourself why coca cola spend so much if ads don’t really work. or read ‘the advertised mind’ if you want further convincing. 95% of indie game developers seem to do no advertising. Of the 5% who try it, 90% seem to put no effort into doing it right, so they give up. You can do everything I’ve described in one day, and it *does* work, if you pay attention to it all.